Same-store sales were down 5 percent in March after a 3 percent bump in December, data compiled by Needham analyst Charlie Wolf indicates. Wolf revealed the figures in a Monday morning note to investors, a copy of which was provided to AppleInsider. Much of the problem, Wolf believes, stems from a lack of major new product introductions which traditionally drive consumers into Apple stores. The iPhone, for instance —Apple's flagship —is also sold in thousands of locations by the company's carrier partners, reducing Apple Store traffic. "The sales performance of the Apple Stores is also hostage to the company's distribution strategies," Wolf wrote. "To illustrate, Mac sales in the stores were adversely impacted in 2009, when Apple broadened Mac distribution in the U.S., adding other chains, such as Best Buy, as resellers. iPod sales in the Apple Stores tanked when iPod demand caught up with supply and Apple responded by vastly increasing the number of outlets selling the product. Same-store sales have also been affected by the roll-out of the iPhone to carrier stores around the globe." 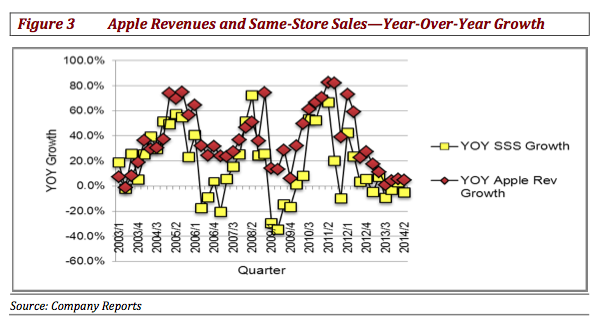 Accordingly, Wolf argues that same-store sales metrics may not be the most important indicator of the retail chain's success. Rather, the division's slice of Apple's overall revenue —which has not fallen dramatically —and its ability to attract new Apple customers are more important measures. "Despite the dramatic expansion of Apple's distribution network to the stores of 250 carriers, the Apple stores have managed to almost hold their own as a percentage of total Apple revenues," the note reads. "This underscores the vitality of the Apple Stores in creating a shopping experience that we believe is superior to that in any other retail chain." The service and support apparatus that Apple has built into the Apple Store is thought to be an important factor for those making the decision to switch from Windows-based computers to the Mac. The bank estimates that approximately half of the Macs sold in Apple Stores are to Windows switchers, who see the stores as the "face" of Apple. Finally, Wolf thinks that incoming Apple retail chief Angela Ahrendts will help speed the company's retail growth in China, where fashion house Burberry enjoyed a significant amount of success under her leadership. The analyst is more skeptical about Ahrendts's ability to have a measurable positive impact on the chain overall, however, due to its dependence on the broader Apple product line. "Nonetheless, what we think the trajectory of same-store Apple Store sales in recent years underscores is that meaningful growth must await the introduction of new products in new product categories," Wolf added. "Tim Cook has indicated that such products are on the way. However, it's an open question whether they can be the blockbuster hits that the iPod, iPhone and iPad were."